Maplehood Watch: November 1 – 14 | Dexless, Maplestory Guides and More! Discussion in 'Maple Updates' started by Nexon, Oct 31, 2017. Join the Maplehood Watch to protect the neighborhood and earn free Cash items! Hunt monsters that are hanging around nearby and you will be rewarded with a random Gachapon/Surprise Style Box item, hair/face coupon, or enhancing item depending on what day it is. Thursday is Beauty Day, Saturday is Enhancement Day, and Tuesday is Gachapon/Avatar Day! To begin, accept the quest ‘[Maplehood Watch] Have fun with Maplehood Watch, everyone’ from the star event notifier on the left side of the screen. This event is available to players Lv. 33 and above (Zero characters must have completed up to Chapter 2). Log in during the event days (Thursdays, Saturdays, and Tuesdays) and hunt monsters within your level range to receive the day’s reward! Thursdays are Beauty Days! This can be completed 3 times per character per day. 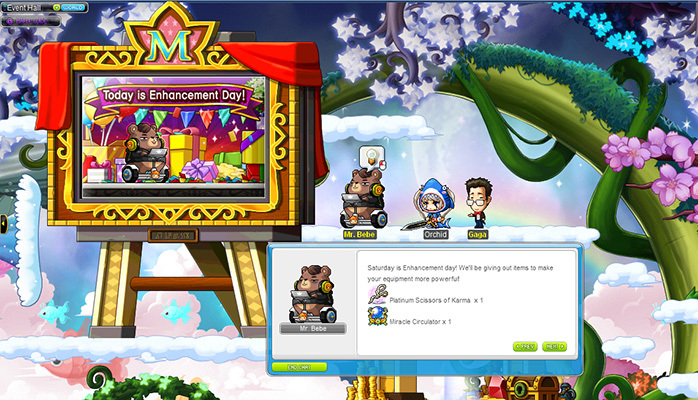 Log in and accept the quest ‘[Maplehood Watch] Beautification Bonanza' from NPC Big Headward located in the Event Hall. Hunt monsters within your level range (20 levels below and 20 levels above) and collect Maplehood Watch Coupon Fragments to receive rewards! On Thursday you can receive one Maplehood Watch Hair Coupon. Take it to NPC Big Headward in Henesys Hair Salon to receive a new hairstyle! Check out the Male Hairstyles that are available: Lop Ear Hair, Wolf Tail Hair, Cute Boy Hair, Heavy Metal Hair, Sweet Kitty Hair, and Wild Tangles Hair. Check out the Female Hairstyles that are available: Lop Ear Hair, Wolf Tail Hair, Mermaid Hair, Bloom Hair, Olive Hair, and Lovely Tangles Hair. You can also receive one Maplehood Watch Face Coupon. Take it to NPC Nurse Pretty in Henesys Plastic Surgery to receive a new face style! Check out the Male Face Styles that are available: Arrogant Face, Piercing Gaze, Sparkling Face, Distant Gaze, Mysterious Face, and Cartoon Face. Check out the Female Face Styles that are available: Wounded Look, Piercing Gaze, Insolent Face, Pure Gaze, Puppy-Eyed Face, and Spica Face. Saturdays are Enhancement Days! This can be completed 2 times per character per day. Log in and accept the quest ‘[Maplehood Watch] New and Enhanced' from NPC Maple Admin located in the Event Hall. Hunt 200 monsters within your level range (20 levels below and 20 levels above) to receive rewards! On Saturday you can receive one Platinum Scissors of Karma and one Miracle Circulator (on non-Reboot worlds) and one Red Cube and one Miracle Circulator (on Reboot world only)! Tuesdays are Gachapon Days! This can be completed 3 times per character per day. Log in and accept the quest ‘[Maplehood Watch] Gachapon Giveaway’ from NPC Cassandra located in the Event Hall. Hunt 200 monsters within your level range (20 levels below and 20 levels above) to receive rewards! Items such as Dominator Pendant, Legendary Potential Scroll 50%, M-day Heart, A-rank Nebulites (Weapon Defense %, Magic Defense %, Max HP, Max MP, Recovery Rate), and Gold and Silver Potential Stamps. Lv. 150 Fafnir set equips/weapons and Lv. 140 Empress set equips/weapons. Permanent chairs such as Bubble Bath Chair, Starry Night Chair, Shroom Buddy Chair, Pink Bean's Magic Chair, Mini Shinsoo Chair, and Oh My Empress. High Quality and Fantastical Androids (male and female available for both). You can also find Metamorph Potions, trait items, restorative potions, and 3- and 4-Star Enhancement Scrolls. Flower Dance, Peach Camellia Kimono, and Sweet Lollipop.